The discovery of a previously unknown breeding site of the white-winged flufftail is very good news for this elusive bird. A white-winged flufftail pictured here in Ethiopia in 2015. Photo credit: Sergey Dereliev, www.dereliev-photography.com. 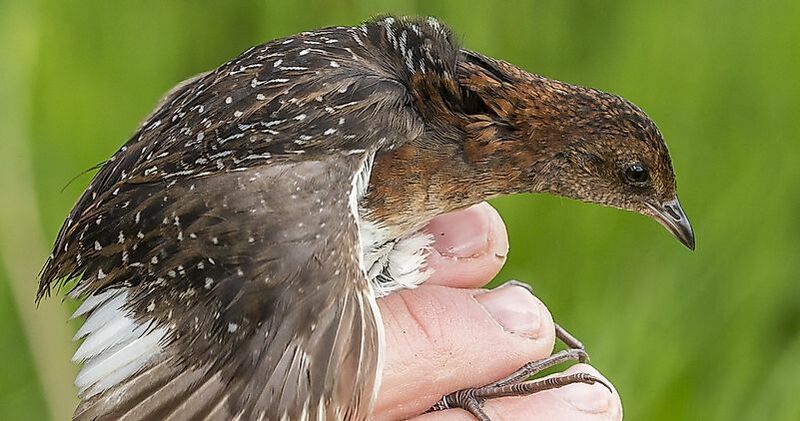 It is time to re-write the bird books as a previously unknown breeding site of the white-tailed flufftail has been discovered. “I was completely taken by surprise and overwhelmed with joy,” Dr. Hanneline Smit-Robinson, the Manager of the Terrestrial Bird Conservation Programme of BirdLife South Africa, said about her reaction to the groundbreaking discovery of the new breeding site of the white-winged flufftail in South Africa. The species (Sarothrura ayres), which is listed as “Critically Endangered” on the IUCN Red List, was discovered in South Africa’s Potchefstroom in 1877. Until now, the predominant belief was that these birds bred only in Ethiopia’s high-altitude Berga wetland in the months of July and August. The birds would then migrate to South Africa where they would stay from November to March, the summer season in the Southern Hemisphere, before flying back to Ethiopia. The birds were, however, not known to breed in South Africa. To learn more about the habitat requirements of the bird, and to estimate their relative abundance in South Africa, BirdLife South Africa was testing the efficacy of the BirdLife South Africa Rallid Survey Method. Using camera-trap technology, this method has been specifically designed to survey the white-winged flufftail in their native habitat. Ornithologist Robin Colyn and ecologist Alastair Campbell of BirdLife South Africa are credited with the development of this method. While surveying the birds using this method at the Middelpunt wetland in Dullstroom, Mpumalanga, an unexpected result was obtained. Footage captured by the cameras exhibited an unprecedented behavior in the birds where members of both sexes were observed flapping their wings, displaying their white wing feathers. What could this behavior possibly mean? Could this mean that the white-winged flufftails were mating in South Africa? It seemed almost too good to be true! Concrete proof came when cameras caught images of young ones of the species ranging from only few-days-old chicks to nearly four-weeks-old juveniles wandering through the undergrowth in the wetland. The preocial behavior of the species (the ability of the chicks to leave the nest and wander around soon after hatching) aided such a discovery. Of the 125,000 images caught by the camera, the researchers were able to detect images of at least three clutches and two mating attempts of the bird. “I’ve always been of the opinion that the species breeds in Ethiopia only and migrates to South Africa, given the various records of the birds between November and March,” says Dr. Smit-Robinson. For Dr. Smit-Robinson and her team, as well as other devoted enthusiasts of this species, the discovery changed everything. The bird books now had to be rewritten to include South Africa as one of the breeding sites of the white-winged flufftail. A celebration after the discovery of a new breeding site for the white-winged flufftail is found. Photo cedit: Niall Perrins. The bird is highly rare in occurrence with only about 250 mature individuals surviving in the wild. Despite efforts to conserve the species, their population is declining fast. Due to their low population numbers, little is known about the white-winged flufftail. One of the main problems associated with the study of these birds is that their call is poorly understood, meaning that the identification of these birds by their call is currently not possible. Given the above facts, the conservationists are worried that if the bird is not saved in time, it might become the first mainland African bird to go extinct. Could The New Discovery Be A Reason To Rejoice? Commenting on the impact of the discovery of the new breeding site on the conservation of the white-winged flufftail, Dr. Smit-Robinson mentions that the researchers are still not sure of the impact the new findings will have on the conservation of the species. However, since the survey indicated low numbers of the bird, it can be assumed that the species is rare and on the brink of extinction. She also mentions that BirdLife South Africa would like to utilize the new Rallid Survey Method to survey three other wetlands in the country with the aim of finding possible presence or breeding sites of the flufftails at such sites. The team at BirdLife South Africa also aspires to confirm the birds’ call to ease the identification process of the species. “The authenticity of the birds’ call is in doubt and one of our aspirations is to confirm the call of this bird. We are also in the process of securing funds to establish a captive research facility for the birds at the National Zoological Gardens, Pretoria, South Africa,” adds Dr. Smit-Robinson. Some initiatives towards the conservation of the species are already in action. In Ethiopia, the breeding habitat of the species is protected against grass cutting and overgrazing by a dedicated team who patrols the Berga wetland area during the birds’ breeding season. Keeping in mind that no conservation work is possible without the support of the local population, the Middelpunt Wetland Trust has funded the building of a school in the area where about 1,200 local children receive their primary level school education. Despite all these efforts, the conservationists believe they still have a long way to go to ensure a secure future for the species. Although the Middelpunt Wetland is a protected environment, there might be other breeding sites of this bird in the country that are exposed to anthropogenic pressures. “There are many questions to be answered and many pieces of the puzzle to be solved,” comments Dr. Smit-Robinson. For now, however, the young white-winged flufftails discovered in South Africa act as a source of inspiration for the bird conservationists by encouraging a further search for this elusive species in similar habitats elsewhere. It is hoped that with time, the efforts of these conservationists will bear fruit and that these birds with thrive. BirdLife South Africa and Middelpunt Wetland Trust would like to acknowledge The Ingula Partnership, Department of Environmental Affairs, Airports Company South Africa and other partners/donors who made this discovery possible.